Home Metals Have Lithium and Cobalt Become Bonafide Tech Plays? Have Lithium and Cobalt Become Bonafide Tech Plays? As the global transition to a post-carbon economy accelerates, there is absolutely no doubt that electrical storage technology will be a critical component of the world’s energy future. Right now, and for as far ahead as anybody can reliably predict, lithium batteries stand as the established technology of choice when it comes to battery storage. That means already high demand for the critical components used to make those batteries, lithium and cobalt, will keep growing—perhaps even faster and higher than anybody now estimates. Cobalt, in particular, could be vulnerable to sudden, unexpected supply interruptions. The primary source of the world’s cobalt is the Democratic Republic of Congo—notorious for corruption and political instability. As for lithium, the supply picture looks brighter, on the face of it. But despite plenty of companies with lithium in the ground, it is a very different thing to get that lithium in usable form to market. You can expect new supply to take longer, and cost more, to come on stream than many of the more optimistic outlooks project. That adds up to a supply crunch for both of these critical battery components—and that means rising prices for both lithium and cobalt—and better fortunes for companies that can reliably supply them to the market. 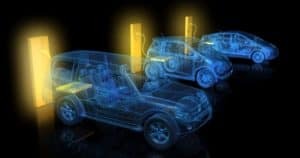 While lithium batteries have long been the mainstay of cordless tools and appliances along with electronics like laptops, tablets, smartphones and scores of other specialized gadgets, the real factor driving demand for battery storage now and into the foreseeable future is the electric vehicle. Whether you’re talking about a plug-in hybrid (PHEV), or pure electric vehicle (EV), consumer uptake of electric vehicles that depend on lithium batteries for power has roared past the early adopter stage and has begun to climb the steep section of the growth curve. Experts in EV markets now forecast global fleet penetration at a total of 10 percent or more by 2025. Compare that to today’s numbers of 1.7 percent and you can see just how much, and how quickly, this market is set to grow. On the conservative side of estimates, BMO Capital Markets pegs market penetration at 10 percent. Others see the EV market share growing much faster than broadly expected. The Economist reports global EV fleet penetration estimates of 15 percent in 2025 and 25 percent by 2030. Conservative or optimistic, that amounts to a lot more battery power on the road, and a lot more demand for critical components of cobalt and lithium going forward. The big question on everybody’s mind—where will the supply come from, and at what price? World demand for lithium continues to surge. The global lithium market is projected to reach U.S. $5.87 billion by 2020, representing a compound annual growth rate of 13.22 percent. While it’s true that there is plenty of lithium around, for investors, the challenge is selecting the right opportunity. Not all lithium is created equal, nor are all lithium producers the right fit for every investment portfolio. Whether you opt for a large-scale, established producer or one of the up-and-coming junior exploration and development companies depends a lot on your investment goals and propensity for risk. And while the future for many lithium companies looks pretty shiny, there’s always some level of risk involved in stock market investments. One of the better ways to approach investing in lithium’s future is to spread the risk among a number of lithium companies—small to large. Lithium deposits occur in two main forms—hard rock and brine. In a brine deposit the lithium is found dissolved in water. Hard rock lithium deposits are exactly what they sound like—solid mineral within rock ore.
Generally, the costs of exploration and development of lithium brine deposits are much lower than the costs for hard rock lithium. Once the predominant source of lithium, hard rock has now taken a back seat to lithium brine, much of it sourced in South America. So, just as all lithium producers differ, so too do the types of lithium deposits they seek to exploit. Because costs are lower, and the time required to go from discovery to operating mine is shorter, investment in lithium brine producers just makes sense. While hard rock lithium will continue to be a source, our money goes on the brine. 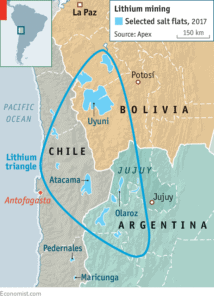 The famed “lithium triangle” of South America has been the subject of much excitement in recent years. The region overlays Chile, Bolivia, and Argentina, and holds more than 50 percent of the world’s lithium. Companies such as Albemarle (NYSE: ALB), Sociedad Quimica y Minera de Chile (NYSE: SQM), FMC Corporation (NYSE: FMC), and others are the big boys on the block in the lithium triangle. Just as noteworthy is the Chinese presence. Tianqi Lithium (SZSE: 002466) and Jiangxi Ganfeng Lithium (SZSE: 002460), with market caps in the $10 billion range, have both established an important presence in South America. Those big fish are surrounded by a group of juniors, hoping to be the next big thing in the lithium triangle. LSC Lithium Corporation (LSC.V), NRG Metals Inc. (NGZ.V), Neo Lithium Corp. (NLC.V) and Portofino Resources Inc. (POR.V) are among a number of junior or exploration stage lithium companies at work in the triangle. Could any of these juniors be takeover targets as big producers and end users begin to consolidate supply? While the lithium triangle is hot, there is lithium exploration work going on elsewhere. Standard Lithium Ltd. (TSX.V: SLL) (FRA: S5L) (OTCQX: STLHF) is a Canadian-based energy exploration and development company that is building one of the largest portfolios of high quality, domestic U.S. lithium brine assets. A big part of the reason for the excitement in the U.S. is Elon Musk with his Tesla Gigafactory located just east of Reno, Nevada. 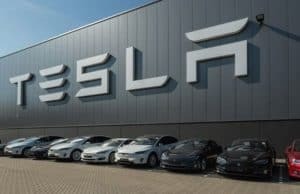 Expected to be one of the largest buildings in the world when complete, and already employing 3,000 people as of August 2018, the gigafactory has sparked a lithium rush in the state. Companies such as Nevada Energy Metals (TSX.V: BFF), Red Mountain Mining (ASX: RMX), Caeneus Minerals (ASX: CAD), Lithium Consolidated (ASX: LI3), Reedy Lagoon (ASX: RLC) are additional lithium plays with a domestic U.S. footprint. The good news is that, as is always the story with stock market investing, all boats rise with the tide. That makes your job of choosing which stocks to buy a little more comfortable. Yet so far, this year, we’ve seen fears growing that the lithium market could reach a state of oversupply. However, we tend to side with those who disagree with that outlook. First of all, a large amount of estimated new supply is expected to come from Atacama in Chile. That supply is hard rock lithium, with an expensive cost base. As we noted earlier, mine capacity does not equate to market supply. That’s because lithium has to be processed before it can be used in batteries. Processing capacity is not expected to expand sufficiently to keep pace with demand. It is also important to note that lithium equities have underperformed lithium prices so far this year. All things being equal, we would argue that the market bias is now to the upside in lithium stocks for the near term. Then there is increasing likelihood of takeovers as producers look to lock in new resources. We’ve already seen what may be the start of this trend with the news in January that China’s Nextview New Energy Lion had reached an agreement to acquire all of the issued and outstanding shares and warrants of Lithium X. Will we see more among the likes of Standard Lithium Ltd. (TSX-V: SLL) (OTC: STLHF) (FRA: S5L), Nemaska Lithium Inc. (TSX: NMX) (OTC: NMKEF), NRG Metals Inc. (TSX-V: NGZ), and Lithium Americas Corp. (TSX: LAC) (NYSE: LAC)? And then there’s cobalt. What can you say about a critical component in the primary battery technology needed to support a post-carbon economy, and the extraordinary growth in the electric vehicle fleet that is primarily sourced from only one country? Especially when that country happens to be the Democratic Republic of Congo? The risk of supply shortage and price shocks are all too real. The DRC supplies roughly two-thirds of the world’s cobalt. Even now, that supply is thought to be in jeopardy. Cobalt prices have already soared 180 percent in the past three years, reflecting skyrocketing global demand. Over the next ten years, that demand is expected to grow by an average of nearly 12 percent compounded annually. Companies the likes of Apple, as well as automakers, are already positioning to buy directly from miners. Diversified companies such as Vale (VALE3-BR), a Brazilian materials miner with holdings in about 30 countries, may offer investors the benefits of cobalt upside with at least some underlying insurance should a particular supply source be cut off. Other top choices might be China Molybdenum (3993-HK), Glencore Plc (GLEN-GB), Freeport-McMoRan (NYSE: FCX) or Zhejiang Huayou Cobalt (603799-CN). Investing in cobalt shares may be a bit trickier than you might expect though. That’s because there are virtually no pure play cobalt miners. Only about six percent of cobalt is produced by dedicated cobalt miners. Ore-forming geological processes accumulate cobalt into mineable concentrations almost exclusively alongside copper and nickel. Anywhere from 94 to 97 percent of the cobalt coming to market today comes from nickel and copper miners. Even if an economical pure cobalt mine were to come on stream, the plant needed to process the raw mineral into usable form is both very expensive and very complex. The hard fact is that there are few new cobalt projects in the pipeline, and most are still in the exploration phase. With experts looking at a 60 percent growth in demand by 2025 and a potential doubling in cobalt price, it’s clear that the downside risk in owning cobalt stocks is considerably limited from a commodities pricing perspective. And with a real possibility of supply interruptions, there is a considerable likelihood of price shocks to the upside—both in the underlying metal and in the shares of companies that mine cobalt and sell it to the battery market. It’s abundantly clear that both cobalt and lithium fortunes are being driven by the fact that they are critical components in the batteries that power a wide and growing range of essential products, including the millions of electric vehicles about to hit the road. That fact ties these two minerals more closely to the fortunes of technology than to the cycles of the natural resources markets. We continue to see lithium and cobalt as essential commodities as the world transitions to a post-carbon economy. Both in the short term, and over the longer haul, cobalt and lithium offer investors the opportunity to make above average to outstanding gains as the deployment of electric vehicles expands, and the global transition to a post-carbon economy accelerates. For more than 25 years, Blake Desaulniers has worked for some of North America’s most prominent investment newsletters and advisory services. His specialty is identifying important trends and technologies before they become common knowledge, and pinpointing the companies best positioned to capitalize on them. Blake has provided direction and editorial for Equity Magazine, BC Business, Financial World, Prospector News, and is the current Editor in Chief at Northern Equity Research. Hey Buddy!, I found this information for you: "Have Lithium and Cobalt Become Bonafide Tech Plays?". Here is the website link: https://financial-news-now.com/have-lithium-and-cobalt-become-bonafide-tech-plays/. Thank you.